Photos of several partial solar eclipses on Mars snapped recently by NASA's Curiosity rover may help scientists better understand the Red Planet's interior structure and composition, researchers say. 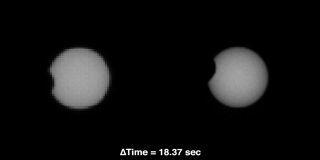 The 1-ton Curiosity rover captured Mars' tiny moon Phobos taking a nibble out of the sun's disk last Thursday (Sept. 13). Several days later, it watched additional partial eclipses caused by Phobos and Deimos, the Red Planet's other minuscule satellite (though images from these last two celestial events are not available yet). Scientists will use these photos to nail down the orbits of Phobos and Deimos precisely, and to determine how much they have changed over the last few years, researchers said. This information, in turn, could yield key insights about the interior of Mars, which remains largely mysterious. Phobos is just 14 miles (22 kilometers) wide on average, and Deimos is even smaller. Many scientists think both satellites are asteroids that were captured by the Red Planet's gravity long ago. Neither moon will be in its current orbit forever. Deimos, which whips around Mars every 30 hours or so, is speeding up, while Phobos is slowing down in its eight-hour orbit. Scientists think Mars' gravity will probably destroy Phobos, perhaps in the next 10 to 15 million years or so. "It will work its way in at some point and get so close that tidal forces from Mars will very likely break it up before it does start grazing the atmosphere and come down," Lemmon said. "So Mars may briefly have a ring system." This map shows the route driven by NASA's Mars rover Curiosity through the 43rd Martian day, or sol, of the rover's mission on Mars (Sept. 19, 2012). By Sol 43, Curiosity had driven at total of about 950 feet (290 meters). The Curiosity team has been doing more than just skywatching since landing the $2.5 billion robot inside Mars' huge Gale Crater on Aug. 5. Researchers have thoroughly vetted Curiosity and its 10 science instruments, which are designed to help the rover determine if the Gale area could ever have supported microbial life. Curiosity has also hit the road recently, traveling a total of about 950 feet (290 meters) from its landing site so far, researchers said today. The rover now sits about 660 feet (200 m) from its first major science destination, a site called Glenelg where three different types of Martian terrain come together. But Curiosity will spend the next several days more or less stationary, gearing up to perform its first contact science operations on a pyramidal rock that mission scientists have named "Jake Matijevic," after a rover team member who died shortly after Curiosity landed. The rover will investigate the 16-inch-high (25 centimeters) rock with its Alpha Particle X-Ray Spectrometer, which measures elemental composition, and its Mars Hand Lens Imager close-up camera. Both APXS and MAHLI sit at the end of Curiosity's 7-foot-long (2.1 m) robotic arm. Curiosity will also zap "Jake Matijevic" with the laser on its ChemCam instrument, which reads rock composition from the vaporized bits, scientists said. While researchers are looking forward to reaching Glenelg, Curiosity's ultimate destination is the base of Mount Sharp, the 3.4-mile-high (5.5 km) mountain rising from Gale Crater's center. Mars-orbiting spacecraft have spotted signs that Mount Sharp's foothills were exposed to liquid water long ago. Mount Sharp's interesting deposits lie about 6 miles (10 km) away. Curiosity — which is currently covering about 100 feet (30 m) on a big driving day but should eventually kick that up to 330 feet (100 m) or so — could be ready to head toward Mount Sharp around the end of the year, rover scientists have said.